Dr Aparna Hegde is the Founder, Chairperson and Managing Trustee of ARMMAN, a Mumbai-based nonprofit dedicated to the wellbeing of mothers and children under the age five whose work impacts the lives of more than 1.5 million mothers and their children in 9 states. ARMMAN’s programs work at scale and have used technology innovatively to maximize outreach without diluting the depth of impact. Dr. Hegde is also India’s leading urogynecologist and the Founder and Director of the Centre for Urogynecology and Pelvic Health (The C.U.P), New Delhi India. 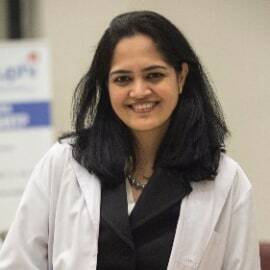 She holds MD degree in ObGyn and was awarded the IUGA (International Urogynecological Association) International Fellowship which she completed in the prestigious Department of Urogynecology at Cleveland Clinic Florida before returning to India. She is an avid researcher with a master’s degree in biological sciences from Stanford University, multiple research awards and more than 75 publications and abstracts in peer-reviewed journals. She is a member of the Editorial Board of the International Urogynecology Journal and the International Urogynecological Association (IUGA) Education Committee. She is an internationally recognized pioneer in the field of 3D and 2D sonographic assessment of the pelvic floor and was invited to deliver a Mini State of the Art lecture on her research work at the 2016 IUGA Annual Meeting in Capetown. She has been awarded a best paper award for her work at the 2013 American Urogynecological Society (AUGS) annual meeting, has been an expert holding a round table on her work on imaging of slings and taught in the ultrasound workshops in the last three IUGA and AUGS annual meetings. ARMMAN has been awarded the WHO Public Health Champion Award in the innovation category in 2017. Dr. Hegde has been awarded the Geneva based Womanity Foundation’s ‘Woman ChangeMaker of the year’ award in 2017. She is a TEDx speaker and was invited by Harvard University to speak at the Harvard India Summit in 2016. She has been featured as one of the five global women leaders in the Voice of America documentary, ‘A Single Step: Journeys of Women Leaders’ narrated by Oscar award winning actress Sally Field in 2015. She has been awarded the “People’s Choice Award” at the Saving Lives at Birth event in Washington DC in 2011, the Woman Icon  award in Asia and South East Asia in Singapore in 2016, the ‘Top 50 Social Innovators’ Award’ in 2014, the Digital Woman’s Entrepreneur Award in 2015, the Mother Teresa Social Leadership Scholarship in 2016 among other awards.